Air Force Sen. Sec. 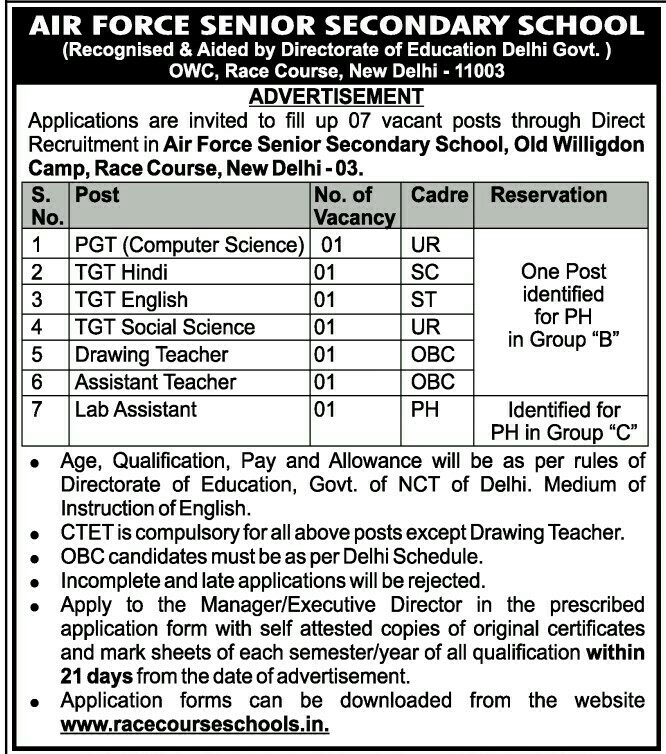 School, New Delhi invites application for various Faculty posts i.e TGT, PGT & others on direct recruitment basis. All eligible candidates may send applications before 20.10.2017. Check the post names, eligibility criteria & other details is given as . Post Name : post wise description is given as below. Note : Central Teacher Eligibility Test (CTET) is compulsory for all posts except Drawing teacher. Essential Qualification : As per norms of Directorate of Education/ Govt. of Delhi. Age : As per norms of Directorate of Education/ Govt. of Delhi. Salary : As per NCT Delhi norms. Eligible candidate may filled in application form in prescribed format given on school website and send it to following address before 20.10.2017. No TA/DA will be admissible for interview. Ensure your eligibility before apply.